Father’s Day is just around the corner and there’s only so many times you can expect your dear husband or dad to fake a smile while he pulls out yet another tie or set of golf tees. While many men appreciate a good tool set, enough is enough already! Why not give your husband or father a gift he will never forget, one that will keep on giving for years to come? 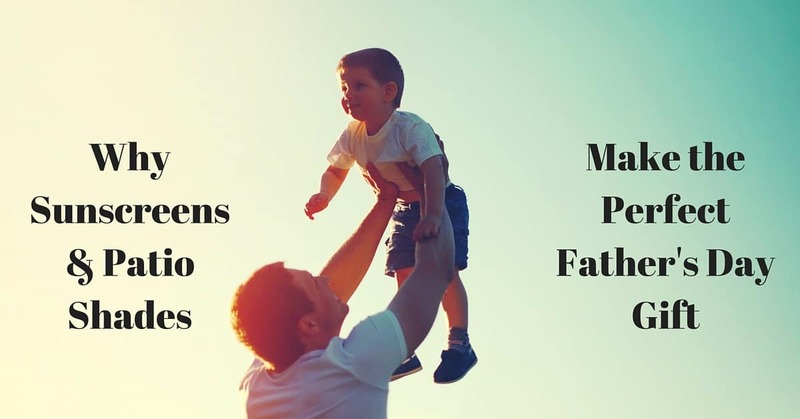 We’ve compiled a list of the three most compelling reasons protective sunscreens or a patio shade will be the best Father’s Day gift for the important men in your life. Who doesn’t love saving money every month? SRP estimates that protective sunscreens on your windows can save an average of 25% of your electric bill each and every month. That sure is a lot more giving back than a measly drill bit gives each month! Does your father or husband hate shopping and decorating? He’ll also save money and hassle of replacing sun-damaged furniture, carpeting, flooring, and window coverings – allowing extra cash for him and the family to do the things you love. Fathers and grandfathers love to be the superheroes, but they’re not always the most careful when it comes to daily safety precautions. They love to be the “defenders of closet monsters” and “defenders of bad boyfriends”, but it might be time to add “defenders of excess sun exposure” to their list of superpowers. Living in Arizona – the state with the highest risk of all skin cancers (University of Arizona), and in a time where 1 in 58 children born in 2009 will be diagnosed with melanoma in their lifetime, the need is definitely there. CC Sunscreens are the perfect way to do so. Our sunscreens block 80-90% of the sun’s harmful UVA and UVB rays, so your husband or father can be rest-assured he is protecting his family from one of Arizona’s worst “monsters”. This is not your average, boring, Father’s Day gift. Your dad or husband will be dying to invite his friends over for a barbeque under the peaceful reprieve of his new, great-looking, patio shade. He’ll be especially excited to show them the automatic features, which intuitively and automatically move the shade up or down depending on the amount of sun exposure or degree of heat. Especially in Arizona, there’s nothing better than being the guy with the best outdoor spot, and patio shades make that happen. Enjoy the heat, with the reprieve of shade. Don’t be wary if it’s hard to top this gift next year, he’ll still be excited about it for years to come. If you’re not sure he’ll love the idea, or you want to make the decision together, call and schedule a FREE consultation with one of our CC Sunscreens experts. We’ll come to your house; answer any questions you and your husband or father may have, measure your doors, windows and/or patio and give you a complimentary and no obligation quote for your sunscreens or patio shades. Call soon, to have your epic Father’s Day gift ready in time!